Welcome to the Crazy Crafters Blog Hop with our Special Guest stamper, Julie Davison - we are thrilled to have Julie join us this month and so excited to CASE (Copy And Selectively Edit) any project that has been created by her . We hope you find great inspiration from the projects. This is Julie's beautiful card that inspired me. 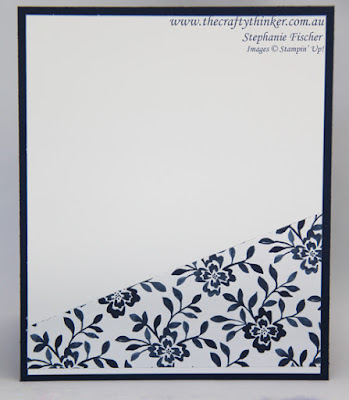 One of the many things that I love about Stampin' Up products is the way they work together so effortlessly. It's so easy to make a special card by combining a stamp set with matching Designer Series Paper. And what really appeals to me about this card of Julie's is that it makes the most of matching combinations and can be dressed up to suit any occasion just by changing the paper, stamp or embellishments. I got so caught up in the enjoyment of CASEing this card that I made three cards to suit three very different occasions. No wastage! The spare piece of DSP decorates the inside of the card! For this very classic looking thank you card, I used the Floral Boutique Designer Series Paper (DSP) and the heart-shaped floral stamp from the beautiful Bloomin' Love stamp set. The greeting is from Flourishing Phrases. The base card is Night of Navy cardstock cut to 12" x 5" and folded in half to form a 6" x 5" card. For the inside of the card and the top layer of the decorative label, I used Whisper White cardstock to match with the DSP. The silver ribbon is from the 1cm Glitter Ribbon Combo Pack. 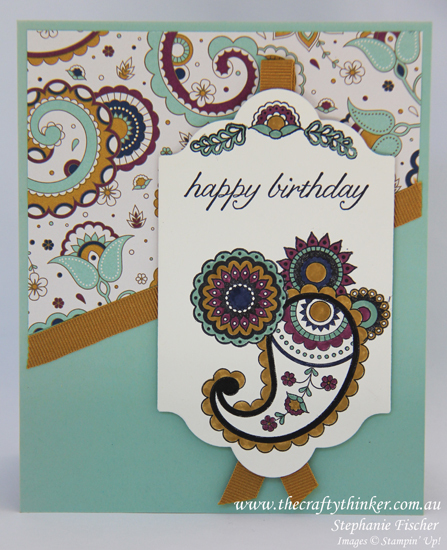 The birthday card combines the very beautiful Petals & Paisleys DSP with the equally gorgeous Paisleys & Posies stamp set. The greeting is from the Birthday Blossoms stamp set. To combine the four paisley elements, I used the masking technique. I stamped the large circle first and covered it with a mask I had pre-made. I then stamped the large curvy element and masked that before stamping the final two elements. I stamped them all in Basic Black Archival ink and coloured them with Stampin' Write Markers. My colour choices were determined by the colours in the DSP. I just can't get enough of the this Paisley Suite! The base card is made from Mint Macaron 12" square cardstock cut to 12" x 5" and folded in half to make a card 6" x 5". 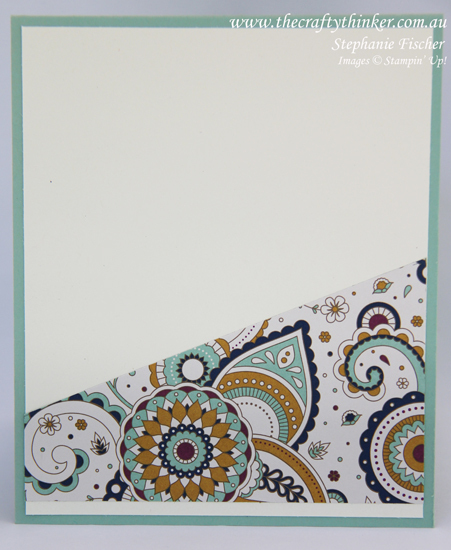 For the inside of the card and for the decorative label, I used Very Vanilla cardstock to match with the DSP. The ribbon is Delightful Dijon from the 1cm Ribbon Trio Pack. The shapes and colours in this paisley DSP are so beautiful! For the Christmas card I used the Candy Cane Lane DSP and layered it onto a base card (the same size as the others) of Crumb Cake cardstock. The ribbon I used is the Real Red 3/4" Stitched Edge Ribbon. And now for something seasonal! 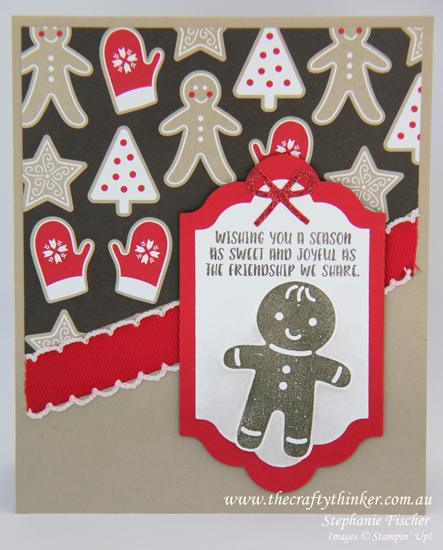 I stamped the gingerbread man from the Cookie Cutter Christmas stamp set and punched him out with the matching Cookie Cutter Builder Punch (buy the bundle and save 10%!). The greeting is also from the Cookie Cutter Christmas stamp set. I added a layer of Real Red cardstock for a bit of Christmas oompth and used one the dies from the Christmas Stockings Thinlits set to cut a little bow from Red Glimmer Paper. The Candy Cane Lane DSP includes so many iconic Christmas images! Another great way to dress up this card layout would be to exchange the label shape for a differently shaped layer: maybe a circle, square or Christmas bauble.